The fighters who sang their songs in Kobanê as the "Army of Hope" have now renamed their group "Berbanga Rojava" (The Dawn of Rojava). Revolutions and social upheavals are always reflected in music. 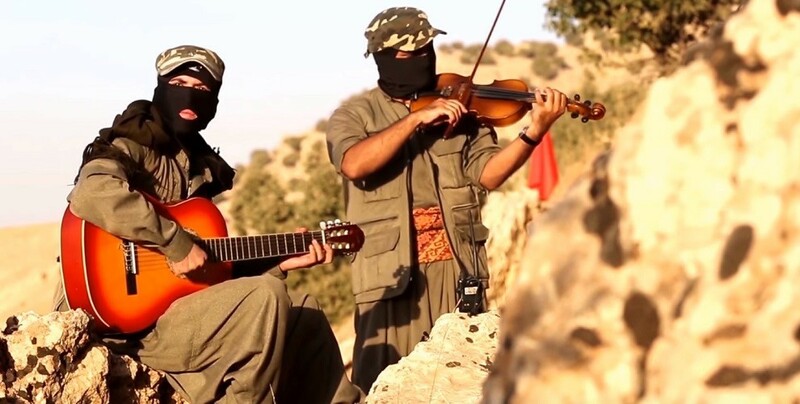 And so, during the Battle of Kobanê, when the Islamic State Jihadist militia invaded one of the cantons of West Kurdistan, which had been effectively self-governing since 2013, we saw images of musicians fighting to sing the songs of the revolution. In fact, these singing fighters of the MLKP (Marxist Leninist Communist Party) Rojava were members of the group Berbanga Rojava, which was at that time called Umudun Ordusu (Army of Hope). In addition to many traditional folk songs from Turkey and Kurdistan in their repertoire, the musical fighters also compose their own songs. 33 Kızıl Karanfil (33 red carnations), for example, is a song for the victims of the attack on Suruç (Pirsûs). 33 mainly young people who wanted to participate in the reconstruction of Kobanê and who traveled to Suruç for this purpose were killed on July 20, 2015 by an IS suicide bomber. ‘Efrîn bernadin' is the name of the new piece of the Dawn of Rojava, which was released just over two weeks ago. Welat Deniz, Rojava correspondent of the ETHA news agency, spoke with Cûdî Firat, MLKP fighter and member of the Berbanga Rojava group. We reproduce some excerpts of the interview. "We founded Berbanga Rojava towards the end of 2016. Basically, it has its beginnings in the band Umudun Ordusu, with which we already sang songs of revolution and hope during the resistance for Kobanê, "Cûdî begins the conversation and continues:" We are participating in the social development of the Rojava revolution. Our interest in it is not limited to war, defense or training. Music is a form of revolutionary productivity for us. However, our musical work also seeks to express our respect for the Revolution, for which we fight and make sacrifices on the fronts, and for all those who gave their lives for the revolution. The songs we sing are part of our fight against the reactionary gangs. They sound on all fronts of the war. On every front, be it in Kobanê or Shengal, in Afrîn or Raqqa, our music is part of our existence. Whenever our comrades sustained an injury in battle or even lost their lives, we first sang our songs shoulder to shoulder, before turning back to our front-line duties." Cûdî Firat emphasizes the expressiveness of the revolution in music, painting, photography, literature and on canvas, and wishes it to be more strongly expressed in all forms of art. "That's why we try to make music videos as often as we can to make a modest contribution." In keeping with the many-colored structure of northern Syria, the "Dawn of Rojava" will continue to sing songs of resistance and hope in all the different languages ​​the region's colorful mosaic has to offer, says Firat. "At the same time, our existence on the fronts of the struggle will continue. We will resist not only for the revolution in Rojava. Also for the liberation of all peoples of Turkey and Kurdistan we will continue our fight against fascism, bourgeoisie and oppression". 18.03.19/ We will Extirpate the Occupants out from Kurdistan!